Most ultra short throw interactive projectors are designed primarily for permanent installation in a wall mount above the screen. The Ricoh PJ WX4141Ni can be installed that way too. But at 6.6 pounds, you can carry it with you, and Ricoh even ships it with a soft carrying case. That makes it a particularly attractive choice if you need to give interactive presentations on the go. If the portability doesn't interest you, the collaboration feature might. Use the menu options to connect the WX4141Ni to another Ricoh interactive projector or whiteboard on your network, and you can see the same images on both, including any notations you add with either device. 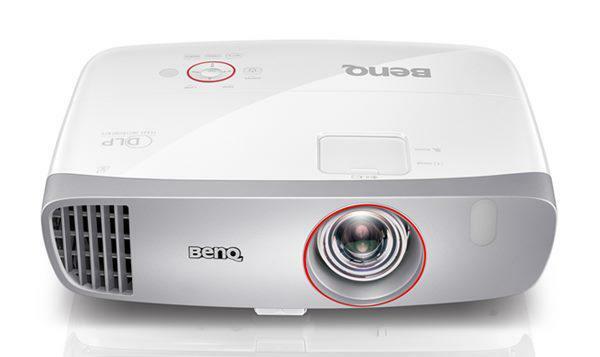 If you need to collaborate between different floors in a building or different buildings altogether, this can also make the WX4141Ni an intriguing choice, particularly since very few interactive projectors offer a comparable collaborative feature. Underlying these features is an otherwise capable, but fairly standard, ultra short throw, interactive projector. It's built around a 1280x800 DLP chip, it uses TI's interactive technology, and it will give you a big image in a tight space. Even if you don't need the portability or collaboration features, it's a more than reasonable choice at $2,040 street. Near-excellent data image quality. The WX4141Ni did a good, but not excellent, job handling color in data images, with saturated, eye-catching color in all predefined modes. However red and blue were a little dark in the brightest mode, as is typical for DLP projectors with large differences between white brightness and color brightness levels. Color balance was excellent, with suitably neutral grays at all levels from white to black in all predefined modes. Very much on the plus side, the projector maintained sharp focus across the screen, which is a challenge for ultra short throw lensing systems. With text, for example, black characters on white were easily readable at 7 points and white characters on black were easily readable at 9 points. It also helps that images designed to bring out pixel jitter and dynamic moire were rock solid in my tests. A minor shortcoming is that every time I turned the projector on or switched image sources away from and back to VGA, I had to manually give the auto-sync command to eliminate jitter and moire. But once I re-synced, the image with analog (VGA) input was as steady as with digital (HDMI) input. As with all but a handful of DLP projectors, I saw some rainbow artifacts (flashes of red, green, and blue) but they showed primarily on images designed to bring them out, and not often enough to be bothersome. Video quality suitable for short sessions. Rainbow artifacts showed more often with video than with static data images, but infrequently enough that even those who see them easily should find them tolerable for clips that last only a few minutes. For longer sessions, however, the artifacts are likely to be annoying. Video was otherwise watchable but unimpressive, mostly because colors were a little dark, bordering on murky. Even so, colors were within the realm of acceptable. In addition, the projector did a good job with shadow detail, and it didn't show any posterization in scenes that tend to cause that problem. 3D Quality. The WX4141Ni supports HDMI 1.4a, which lets it show 3D from a Blu-ray player or other video device. In my tests, it worked with both 120Hz and 144Hz DLP-Link glasses for games and with 144Hz glasses only for Blu-ray 3D. I didn't see any crosstalk and saw only a hint of 3D-related motion artifacts. However, I saw a distinct flicker with some scenes. How easily you see flicker depends on your individual level of persistence of vision, so you may not see the problem. An excellent projector indeed! Innovation combined with good design from Ricoh.. And at just 11cm from the wall, it is great for very small meeting rooms, and digital signage solutions in a retail environment.